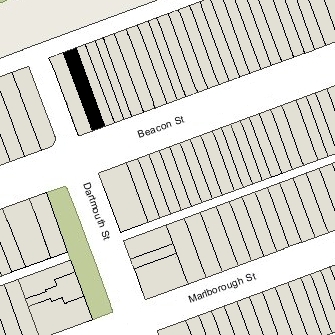 232 Beacon is located on the north side of Beacon, between Clarendon and Dartmouth, with 230 Beacon to the east and 234 Beacon to the west. 232 Beacon was built ca. 1863, one of a symmetrical pair (232-234 Beacon), as the home of Alfred Augustus Reed on land which he purchased as a trustee on June 16, 1862, from the Boston and Roxbury Mill Corporation. Click here for an index to the deeds for 232 Beacon. Alfred Reed was an East India Merchant. He and his wife, Caroline Susette (van Son) Reed, had met and married in Java in 1845 and had continued to live there until 1857. They returned to live in West Roxbury, where she died in March of 1861. After returning to the United States, Alfred Reed had entered the cotton textile manufacturing business, founding the Oriental Mills in Providence and Warwick, Rhode Island. He continued to live at 232 Beacon until about 1867, but had moved thereafter to the Apponaug district of Warwick. He continued to own 232 Beacon. By 1868, 232 Beacon was the home of John Seabury Eldridge and his wife, A. Louisa (Thompson) Eldridge. They previously had lived in Canton, where they continued to maintain a residence. John Eldridge was a lawyer and President of the Boston, Hartford, and Erie Railroad, and had served as a member of the Massachusetts State House of Representatives in 1859-1860 and as a member of the State Senate in 1865. By 1869, they had moved to 125 Beacon. By 1870, 232 Beacon was the home of railroad executive and former China merchant George Tyson and his wife Sarah (Anthony) Tyson. They continued to live there in 1871, but by 1872 had moved to 314 Dartmouth. By 1873, 232 Beacon was the home of broker Charles Willis Morris and his wife, Eliza (French) Morris. They previously had lived at 20 Hancock. Alfred Reed died in October of 1878, and Samuel Ames of Providence was named as successor trustee of his trust, which continued to own 232 Beacon. 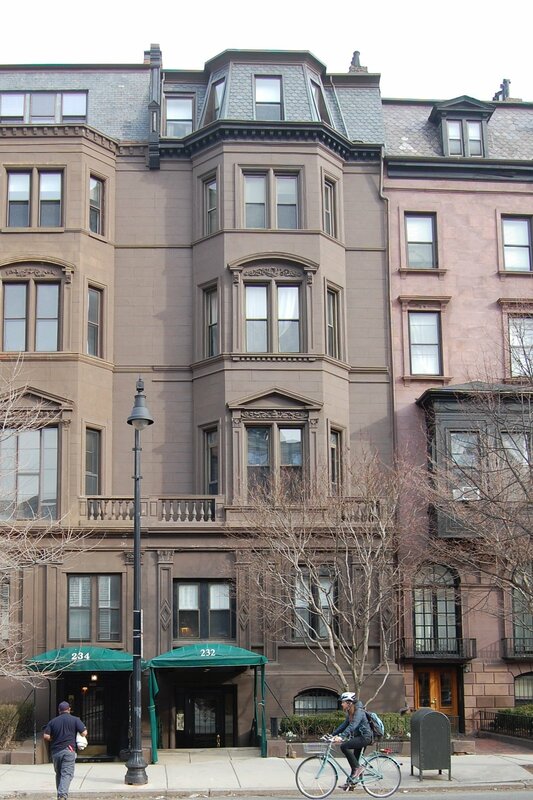 On February 7, 1883, he sold 232 Beacon to George Bigelow Chase, who lived at 234 Beacon. Charles and Eliza Morris continued to live at 232 Beacon during the 1884-1885 winter season, but moved soon thereafter and by 1887 were living at the Parker House Hotel. By the 1885-1886 winter season, 232 Beacon was the home of dry goods merchant and importer Joseph Swain Lovering and his wife, Mary (Taylor) Lovering. They previously had lived at 191 Beacon. They continued to live at 232 Beacon until their deaths, his in October of 1894 and hers in January of 1895. On August 8, 1893, George Chase transferred 232 Beacon and 234 Beacon along with other property to attorney Charles Sedgwick Rackemann as trustee for the benefit of his creditors. On May 21, 1895, 232 Beacon was acquired from Charles Rackemann by Alice Williams (Twombly) Jones, the wife of Frank William Jones. During the 1898-1899 winter season, the Joneses were living elsewhere — probably in Europe — and 232 Beacon was the home of dry goods merchant Francis Wright Fabyan and his wife, Edith (Westcott) Fabyan. 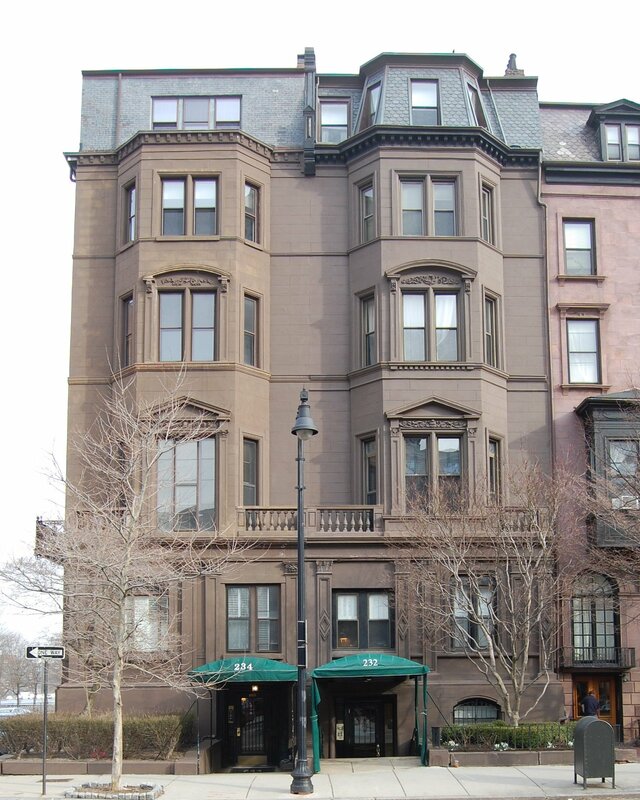 They had lived at 1 Charlesgate East during the previous season, and by the 1899-1900 season had moved to 217 Beacon. During the 1899-1900 winter season, 232 Beacon was the home of Frederick Ayer and his wife, Ellen Barrows (Banning) Ayer. Frederick Ayer began his business career as a manufacturer of patent medicines in partnership with his brother, Dr. James C. Ayer. He subsequently entered the textile manufacturing business in Lowell and Lawrence, and (with his son-in-law, William Madison Wood) was founder of the American Woolen Company. The Ayers lived at 232 Beacon and at their home in Lowell while they were having a new home built at 395 Commonwealth. By late 1900, 232 Beacon was once again the home of Frank and Alice Jones. He died in December of 1900, and Alice Jones subsequently traveled abroad with their daughters, Charlotte and Minna. By the 1902-1903 winter season she was living at The Tuileries at 270 Commonwealth, and by the 1903-1904 season at 401 Marlborough. On May 13, 1901, 232 Beacon was purchased from Alice Jones by Richard Dudley Sears. He and his wife, Eleanor (Nellie) Mary (Cochrane) Sears, made it their home. During the 1900-1901 winter season, they had lived at 245 Commonwealth. They also maintained a home at Prides Crossing. Richard Dudley Sears was a real estate trustee. In 1881, he had been the first American men’s singles champion in lawn tennis, and was the winner of that title for each of the six following years. On March 28, 1922, Richard Sears transferred 232 Beacon into his wife’s name. Their son, Richard D. Sears, Jr., lived with them. He was an investment broker and president of the New England Oil Refining Company and the Richdale Oil Corporation. He married in March of 1926 to Frederica Fulton Leser and they moved to 9 Exeter. Richard D. Sears, Sr., died in April of 1943. 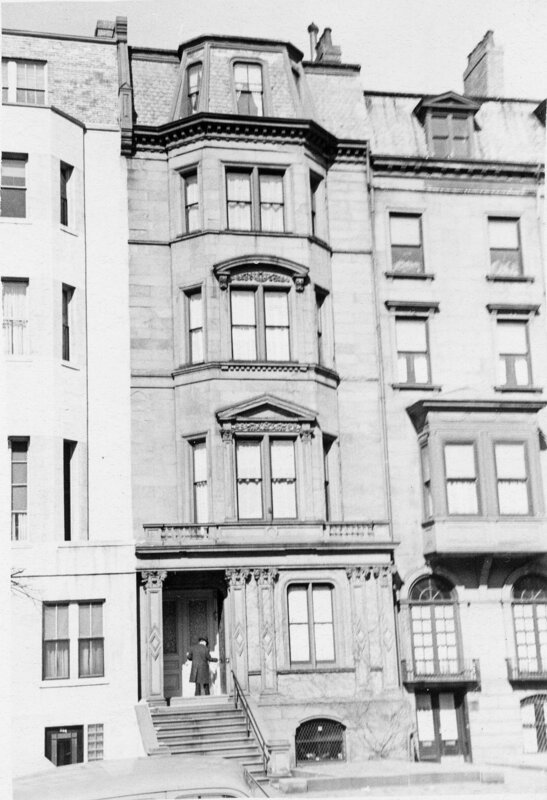 Eleanor Sears continued to live at 232 Beacon until 1949. On December 1, 1949, 226 Beacon was acquired from Eleanor Sears by the Harold Realty Company. In November of 1949, it applied for (and subsequently received) permission to convert the house from a single-family dwelling into seven apartments. In February of 1950, it amended the application to increase the number of units to eight. It was probably at this time that the front entrance was lowered to street level. The entrance had not been changed as of the early 1940s, but had been modified by the mid-to-late 1950s. Based on photographs from that period, it appears that as part of this remodeling, a projection containing a window was added at the first floor, where the entrance originally had been, somewhat matching the modern façade installed at 234 Beacon in the early 1940s. This first floor modification of 232 Beacon subsequently was remodeled again, reversing much of the previous “modernization” and restoring the original pilasters that flanked the entrance (which may have been retained behind the “oriel” addition). This subsequent remodeling may have occurred at the same time the owners of 234 Beacon remodeled their façade to restore much of its original appearance. On April 29, 1963, 232 Beacon as purchased from the Harold Realty Company by Thomas W. Cunnington and his wife, Madeline A. (Reilly) Cunnington, who lived in one of the apartments. They previously had lived in Malden. He was an engineer with Raytheon and later would become chief executive office of the Ward Williston Oil Co. They continued to live at 232 Beacon in 1964, but had moved to an apartment at 313 Commonwealth by 1965. On February 14, 1964, 232 Beacon was acquired from the Cunningtons by real estate dealer Edward L. Britt and his wife, Ann M. (Lynch) Britt. They also owned 228 Beacon and 230 Beacon. 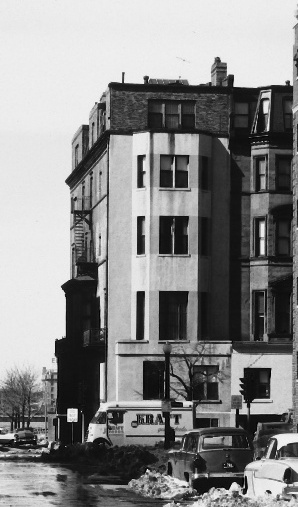 On August 30, 1972, Edward Britt converted 232 Beacon into eight condominium units, the 232 Beacon Condominium.